A few weeks ago I had the pleasure of sharing a video tutorial on WPlus9 blog. I’m not going to profess my love for this brand and Dawn again (I seem to be doing that in every WPlus9-reated post I write), I’m just going to say – I love their products. This time I had the opportunity to play with their felt – and oh boy! It cuts like butter and it holds its shape together so nicely (the only other felt that is like this that I know of is from Simon Says Stamp). 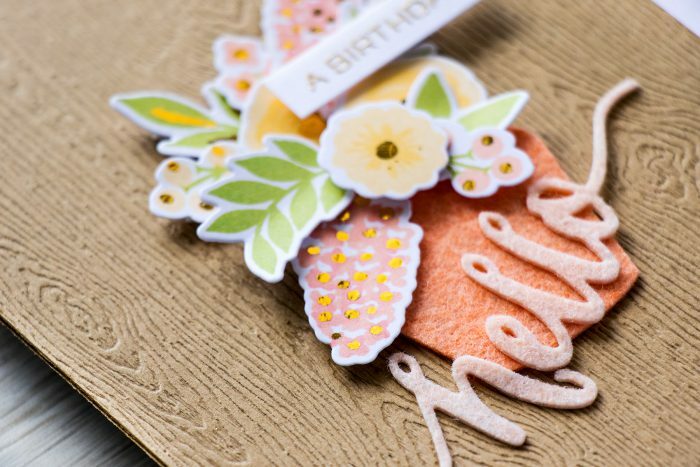 But this post is now really about felt or die cutting. Today I want to continue exploring ways to step up Color Layering images and ways to use less colors of ink. In my previous post for WPlus9 I used white pigment ink to mute the color of a dye ink and thus use less colors to stamp a beautiful floral bouquet. 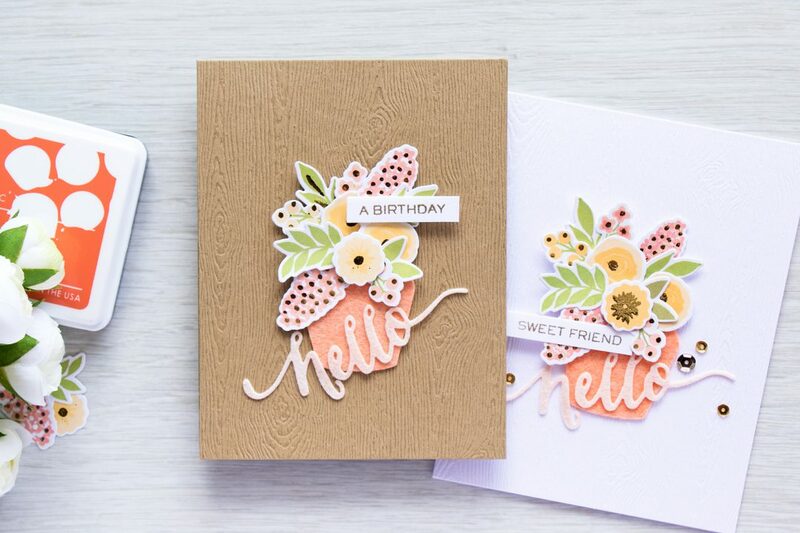 Today I’m inviting you to use heat embossing and later foiling to add beautiful foiled accents (and skip using one color of ink) for floral images. 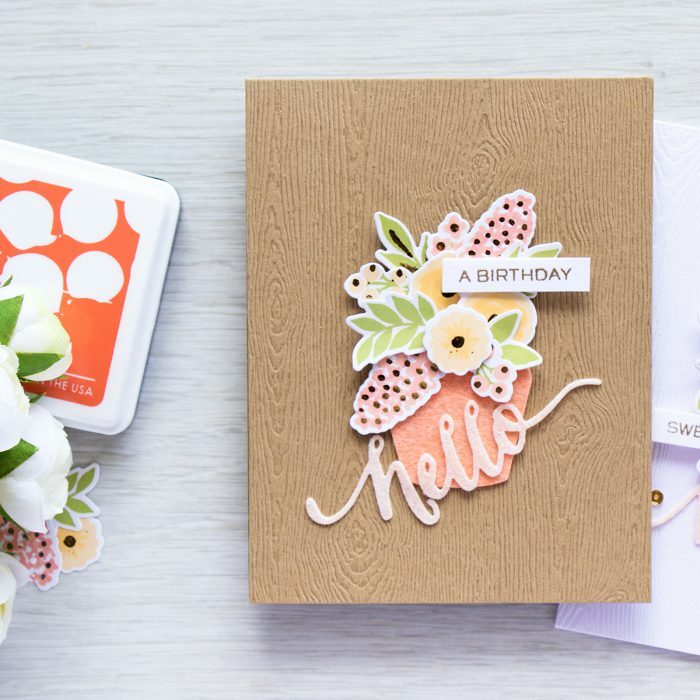 The stamp set I used for this project is called Fresh Cut Florals, however many other floral (and probably not only floral sets) should work just fine. The idea is to stamp the first and second layers using inks and do the final, top layer with the help of foil. 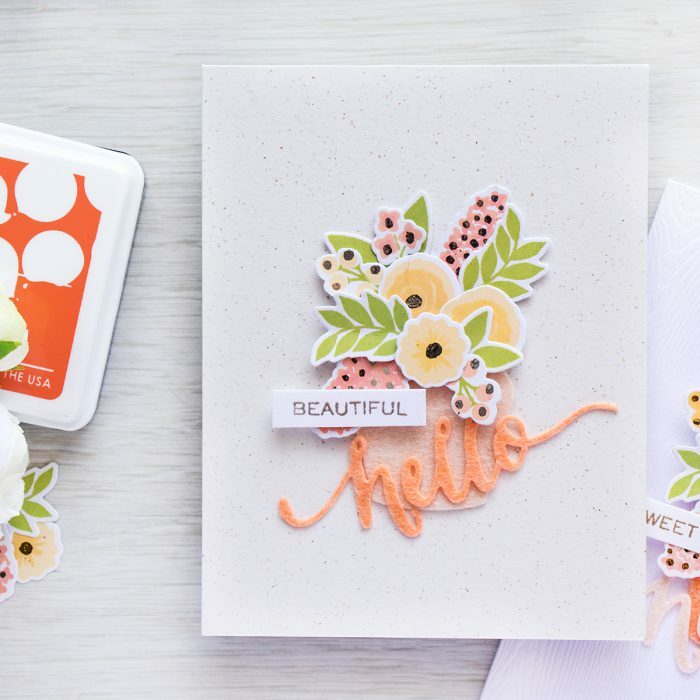 Because foiling with heat embossing isn’t going to be 100% perfect its best to use images that are small (like the centers on the flowers represented by dots). That way imperfections will be minimal and will not show up much. 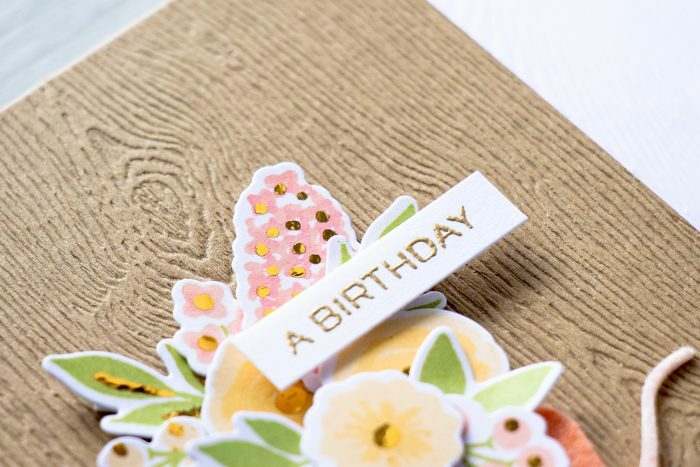 I had the best success by foiling dots with the help of this technique, I didn’t much like the way I was able to foil lines (for example on the leaves); the sentiments didn’t foil well at all. The reason for this is that embossing powder, when heated in the foiling machine spreads a bit and thus distorts distorting the final foiled image. It works okay for dots, but not for something that is detailed. 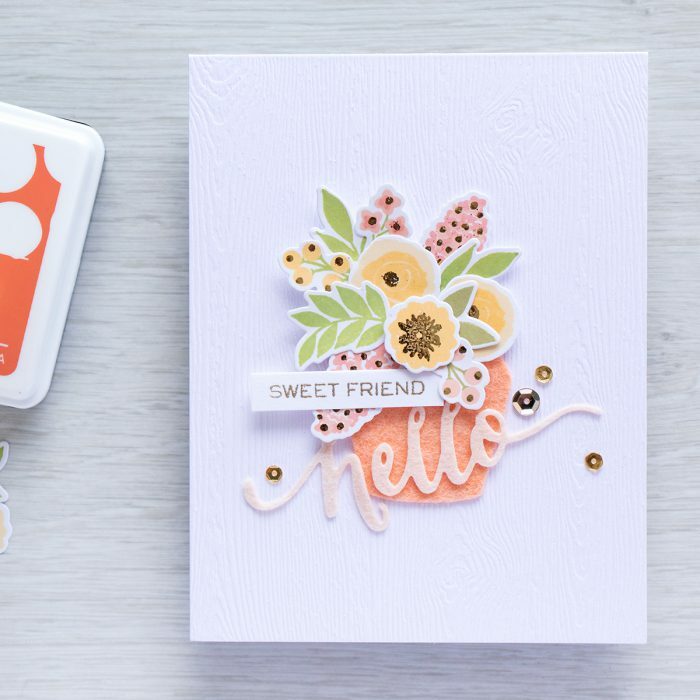 I stamped, heat embossed and foiled a bunch of images (it was very helpful to work in assembly line type fashion – something I learned from Jennifer McGuire). To put these into cards I die cut jars to be used as flower pots. Instead of using cardstock I used WPlus9 Wool felt in Peach colors. I also die cut a Hello word, again out of felt. To make it easier to adhere it onto the jar and onto the card base I added a layer of adhesive before die cutting. I made 3 cards in total (plus I had lots of left over stamped and foiled pieces that I used to make another card which I’ll share later) and had a blast while I was at it. This did take quite a bit of time, I guess it would have taken less if I were to make less die cuts, but I didn’t mint. Who doesn’t want to spend extra time in the craft room, right? Here are the other two cards I made – they are identical, the only difference is in the cardstock I used for the card base. The first one uses white woodgrain and the second one uses Spicy Yogurt. So beautiful Yana! I love the color combos and all the different textures you put together. Thanks for sharing and always inspiring. 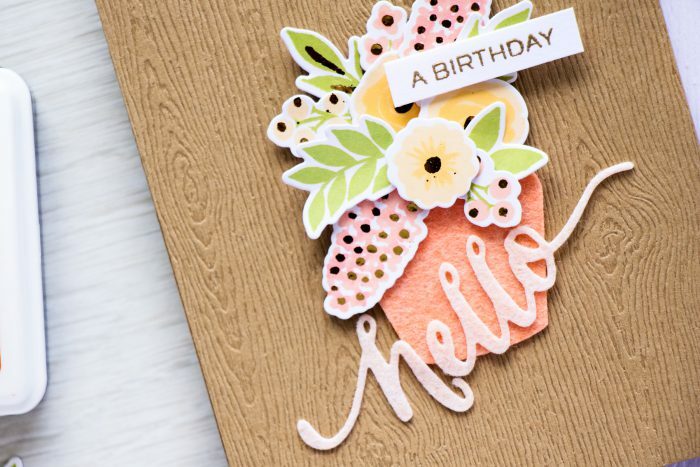 This is such a beautiful card and a great idea. TFS! This card is just gorgeous! And I understand the love of Dawn and Wplus9! !